Trinkets is coming to the small screen. Netflix just announced they’ve ordered a TV show based on the young adult novel by Kirsten Smith. The drama follows “three teenage girls from different corners of the high school cafeteria [who] find themselves in the same mandated Shoplifter’s Anonymous meeting.” The cast includes Brianna Hildebrand, Kiana Madeira, Quintessa Swindell, Odiseas Georgiadis, Henry Zaga, and Larisa Oleynik. 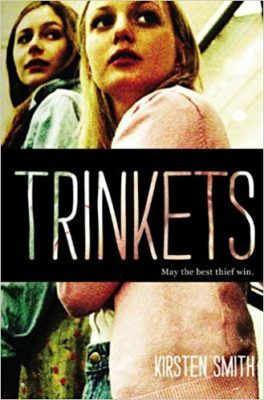 Netflix has ordered Trinkets, a new series based on the young adult novel by Kirsten “Kiwi” Smith, who will serve as an executive producer. Logline: When three teenage girls from different corners of the high school cafeteria find themselves in the same mandated Shoplifter’s Anonymous meeting, an unlikely friendship forms. Elodie – the grieving misfit, Moe – the mysterious outsider, and Tabitha – the imperfect picture of perfection, will find strength in each other as they negotiate family issues, high school drama and the complicated dilemma of trying to fit in while longing to break out. Brianna Hildebrand (Deadpool, Tragedy Girls) stars as Elodie. Kiana Madeira (The Flash, Sacred Lies) stars as Moe. Quintessa Swindell stars as Tabitha. Odiseas Georgiadis (The Stand-In, Dr. Bird’s Advice for Sad Poets) stars as Noah. Henry Zaga (13 Reasons Why) stars as Luca. Brandon Butler (13 Reasons Why) stars as Brady. Larry Sullivan (Big Little Lies, Scandal) stars as Doug. October Moore (Baskets, Grimm, Portlandia) stars as Vicky. Larisa Oleynik (Mad Men, Hawaii Five-O) stars as Shawn. What do you think? Are you familiar with the novel Trinkets? Will you watch the Netflix series? More about: Netflix TV shows: canceled or renewed?, Trinkets, Trinkets: canceled or renewed?